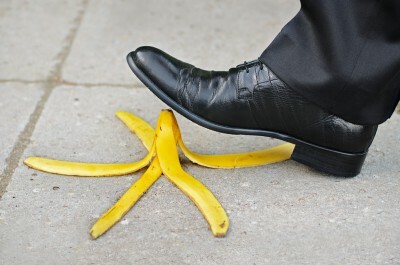 From anything a slip and fall accident can happen like from a banana peel, If you or a loved one has suffered a slip and fall accident, allow us to work with you and build a solid case. Posted in Oxnard on Friday, Aug 18, 2017. When it comes to slip and fall accidents, anything can happen. These accidents can cause devastating injuries to victims for which they can seek compensation. An Oxnard slip and fall attorney can represent these victims and help them obtain compensation for all losses and injuries sustained in the accident. Wet surfaces – This accounts for over 50% of all slip and fall accidents. Sometimes there are parking lot potholes, torn carpeting, mopped floors, and other conditions that may create a hazardous situation. Hazardous weather – Some conditions such as rain and ice may cause a slip and fall accident. Although the weather is often unpredictable, property owners are responsible to keep their properties safe. Inadequate or insufficient training – Many slip and fall accidents take place in factories where employees have to walk in very narrow pathways and perform many tasks without proper training. When employers don’t provide their employees with adequate training, they may be responsible for the accident. Nursing homes accidents – As people age, their bodies become frail and their mental health can also suffer. Elderly individuals are more at risk of falling and when they do they generally sustain severe injuries that require long-term treatment. When caretakers don’t monitor these older patients as they should, they are more at risk of experiencing these accidents. Bad footwear – Nothing worse than wearing uncomfortable shoes. Unfortunately, almost 30% of all slip and fall accidents are caused by the footwear. Even the most comfortable shoes such as sneakers and boots can cause devastating accidents when they don’t have good traction. Lost wages – When you are injured in an accident you probably stop working until you fully recover. You employer will write down how much time you were absent and your salary at that time. You should be compensated for all your lost wages plus taxes. Your earning capacity – If your injuries were very severe and you were not able to perform your responsibilities at work, you will be compensated for your diminished capacity to earn. Other expenses – You may also be compensated for travel expenses, and any other incidental expenses that may apply to your specific case. There is also a small percentage of fraud cases but fraudulent slip and fault claims are very rare. In spite of the genuinity of these cases, employers and lawmakers still look at these claims with suspicion. This is why so important to seek the legal advice of an Oxnard slip and fall attorney. Remember property owners will not pay unless you prove they are responsible for the accident. If you or a loved one has suffered a slip and fall accident, allow us to work with you and build a solid case. Contact us today and schedule your initial case evaluation with attorney J. Jeffrey Herman.